John Cassaday - first time I saw his work on Desperadoes, a western adventure comic for Wildstorm, it didn't exactly do much for me. Looked too artificial, no flow, bleeaauugh. Ditto for Union Jack, this was clearly not my kind of artist. So when I heard Warren Ellis was drawing for him for some Authority-spinoff called Planetary, I wasn't exactly over the moon. After all, he was up against Bryan Hitch, and clearly there was no contest. Shows you how unwise it is to prejudge. 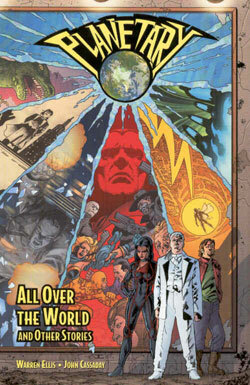 In a style totally consistent with his previous work, Cassaday created a spectacular world for Wildstorm, filled with the most remarkable creatures and an eye of the greatest director in the world. Each panel could take you days to appreciate - handy, given Planetary's upcoming schedule. His work on Captain America reinvented the character again, and his chainmail/scalemail never looked finer and set a precedent for all artists who followed him. And when I learnt he was drawing Astonishing X-Men with Joss Whedon for Marvel, well, I could hear dollar signs light up in every retailers' eyes in the USA. John Cassaday is at the top of his game. He only has peers, no superiors. So where does he go from there? How will his work fit in with the new editorial edicts at Marvel? And what is the future of Planetary? I'd better get on and ask him, hadn't I? RICHARD JOHNSTON: X-Men Reload is promising a return to a more traditional looking X-Men. Indeed, Joss explicitly states the case for spandex in the first issue of Astonishing. As someone who's trod both paths (Planetary AND Union Jack) and given a new weight to Captain America's look, what role do you believe the costume has in modern superhero fiction? Does it make your job any easier? JOHN CASSADAY: Initially comic artists put heroes in tights to speed up the process; Draw a hero in his shorts, draw a line across his neck and he's done! Few artists work that way anymore and even fewer heroes are in tights. Although a character may be in tights, there are still wrinkles and folds in the material. There's a texture and weight to everything. I do my best to at least hint at that. I want the heroes to be fantastic, but believable. I want it to look like a guy in a suit, costume or uniform. But I'm not looking for ultra-realism, I want style. I definitely don't want the characters to look like "just another comic-book superhero." RICHARD: Do you think the leathers worked against that? JOHN: I did like the leather look, but that's done and gone now, isn't it? Time for change. And you'll see, the costumes return for a reason.